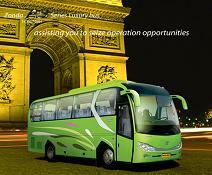 A5 Series bus is the latest launched luxury medium-size bus in 2005 by Zonda Auto. The dynamic geometrical structure and fashionable curve design assure its harmony, fantasy, elegance and beauty at the front walling. Under the creative and optimized design directives, the model has unique arc transition softening dashboard, new style reading lamp, adjustable & comfortable high back-rest seats, multi-VCD, and multi-functional water-drinking machine. All above bring you much comfort and care for the experience of "Zero-distance". It adopts advanced full-loaded bus technology, get-through luggage compartment, outstanding power matching, stable output, low noise, ABS, auto-adjusting arm, which assure the complete bus safety and passengers' comfort. With the combination of the dynamic appearance, wide and comfortable inner space, strong power and outstanding performance, it brings one new spotlight to the tourist market. CA engine produced by the a famous engine company in China. seating capacity is from 25 to 33.